Are you wondering about our ideas regarding our patterns? How accurately we control the quality and do we know well enough about creating unique wall decorations? Can I trust Bimago to create a painting, wallpaper or a sticker for my home? Let us show you! We will guide you through the whole production process. 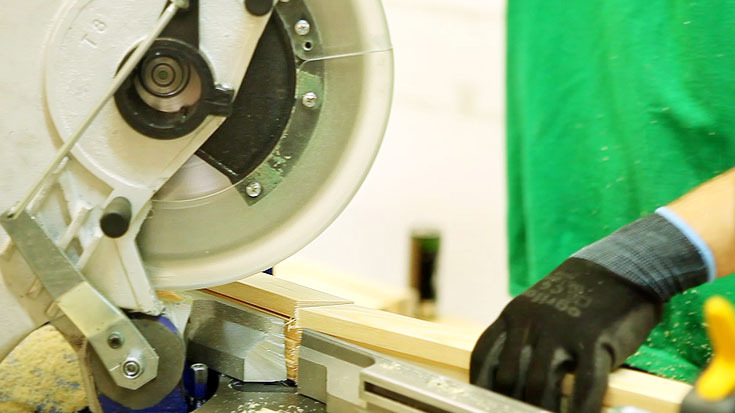 Learn more about our high-quality materials, skills and commitment in our staff manifested in every complete order. 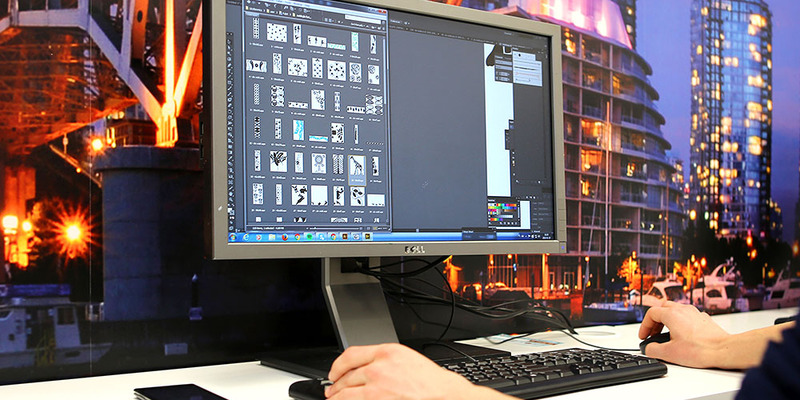 We guarantee the same precision and accuracy in everything we do by creating paintings and wallpapers for you! Handmade paintings are one of the most important and oldest products in Bimago online gallery. 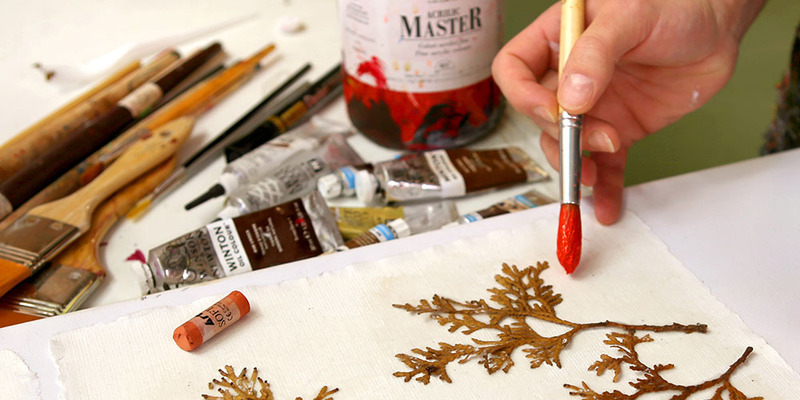 The most experienced and talented artists are designing and creating our handmade products. We want the paintings hanging on your wall to be true works of art - original and simply stunning! Therefore, each of the patterns from the handmade paintings collection is carefully designed specifically for this particular technique. By ordering a handmade painting you start a complicated production process: we will not only ensure an exact replication of the pattern, but also match it with originality and a uniqueness for the artwork. How do we do that? 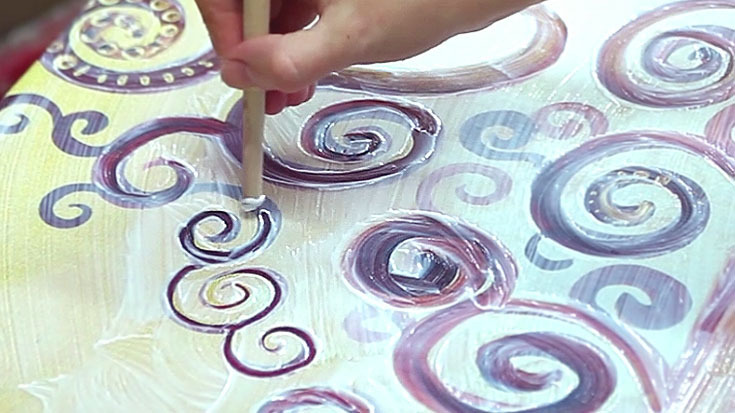 Find out how our handmade paintings are being created! 1. Have you chosen a pattern yet? 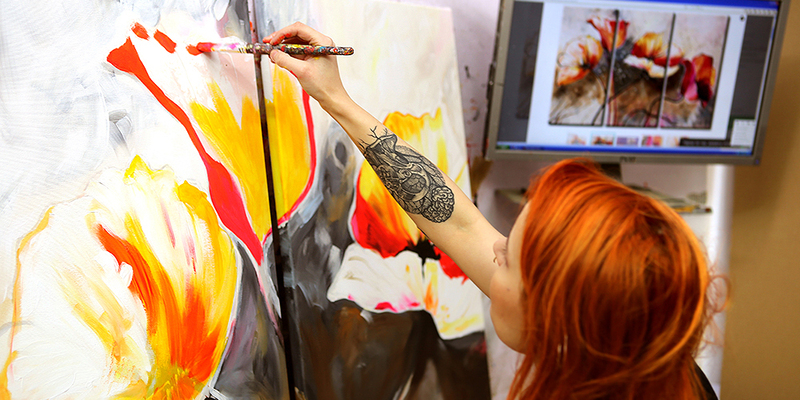 Before joining the Bimago collection every painting was conceived and designed in every detail by one of our artists. 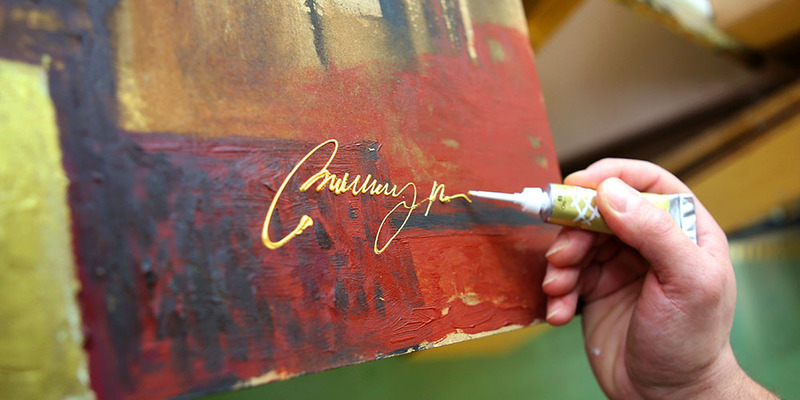 This person will leave his signature on the finished canvas. 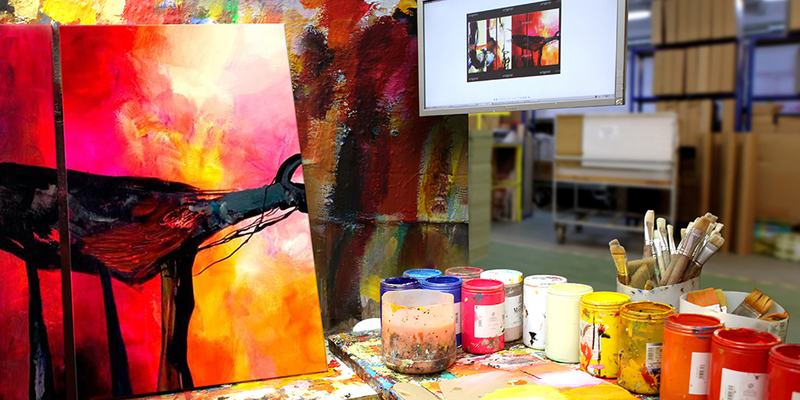 Once our processing system will record the payment for the ordered painting, production department proceeds to work. 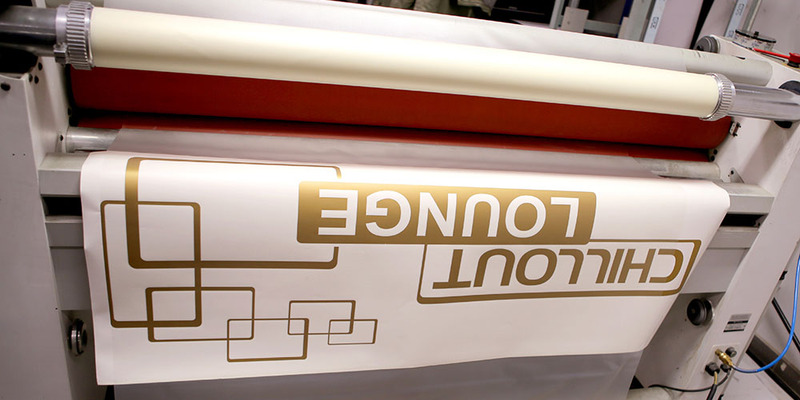 We start from printing order request, which precisely defines the properties of your future decoration. 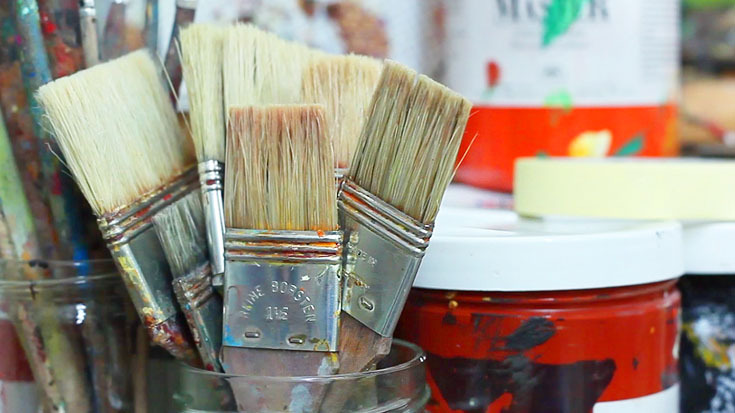 Our technicians prepare all the materials that are necessary for the painters: white canvas stretched on highest quality wooden frameworks, in your chosen size and thickness. When the canvas and brushes goes back to one of our experienced artists - he is looking at the original pattern during whole working process. Your wall will be decorated by the pattern you choose - but it will be as unique as the brush strokes of any painter. 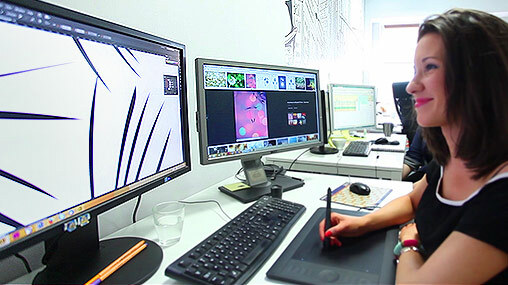 Bimago team consists of the most talented and experienced artists. This ensures that your image will be painted with feeling and passion and finished with perfection. When painter puts the brushes down, it's time for one of the many quality controls. 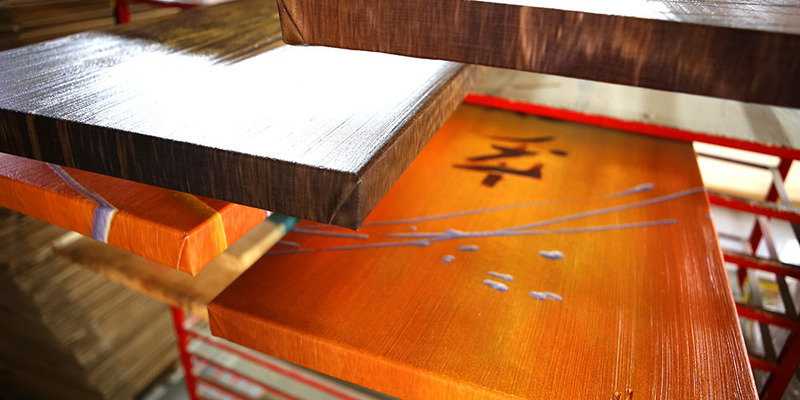 Paintings made with accuracy and in accordance with the original design will be forwarded to drying. After maximum three days of drying the painting is ready to decorate your wall. Now we are able to proceed with packaging. 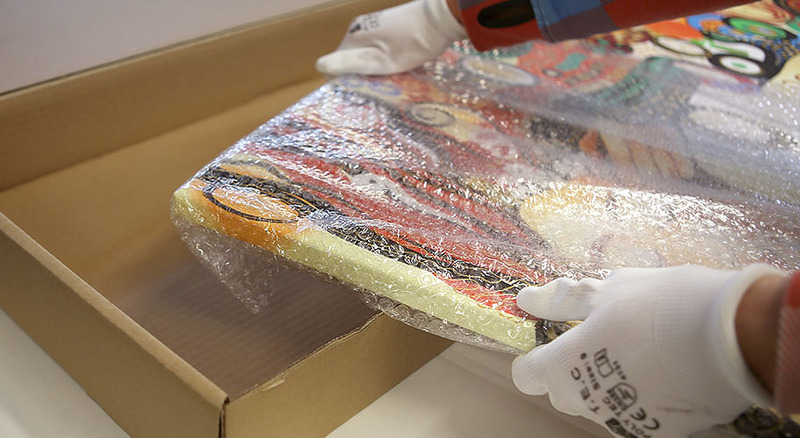 We secure the canvas with a bubble wrap and a layer of plastic protection in order to make sure that nothing could be damaged. 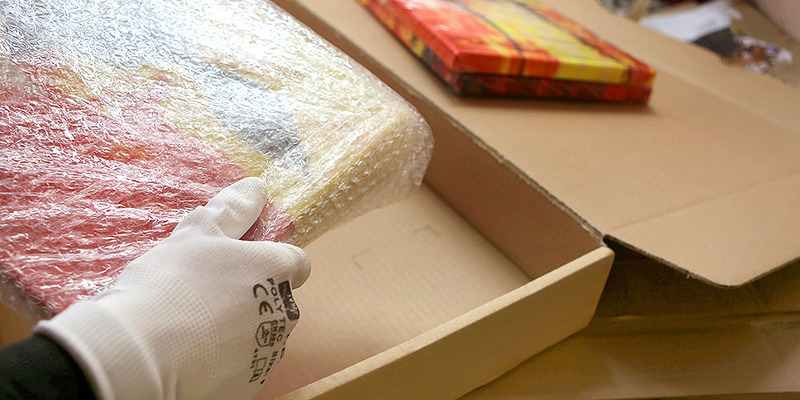 Do you think that the carton box for the painting is the most ordinary thing in the world? This not the case. We optimized its size and weight in order to protect the canvas and at the same time made it suitable for the canvas to have comfortable to transport to your door. The carefully packed parcel is now transferred to the logistics department. With a glued waybill - it will soon be picked up by the courier. Shortly thereafter your painting will decorate your wall! Prints on canvas are not only practical and modern, but also decorative, if they are skillfully prepared, of course. Our keys to success: a well-developed manufacturing process and the highest quality materials in the hands of professionals. Still in doubt? Ask one of our specialists how permanent pigments are used in our toners or why we use the so thick canvas and not any other quality. They know how to shorten the production time so you don’t have to wait for a painting longer than necessary. They personally control the saturation of the colors as well as the photographic accuracy of the print. Wall decorations ordered in Bimago will always have the best quality! Each of the patterns is initiated as an idea in the head of one of our creative graphic designers. It is designed entirely from scratch or on the basis of the most interesting photos from the photo bank. Each developed and approved pattern goes to the Bimago collection. Have you chosen the right pattern and paid your order? 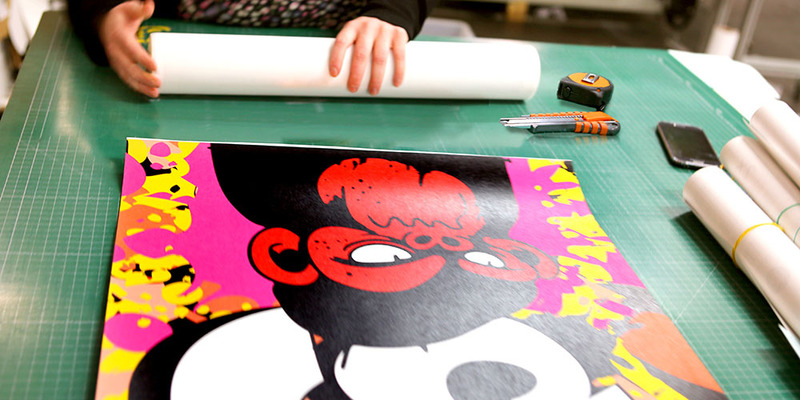 This means that the production department proceeds to work on your canvas print. At every step the production staff will be accompanied by a precise specification - in order to make sure that the final result will be perfectly identical to your order. 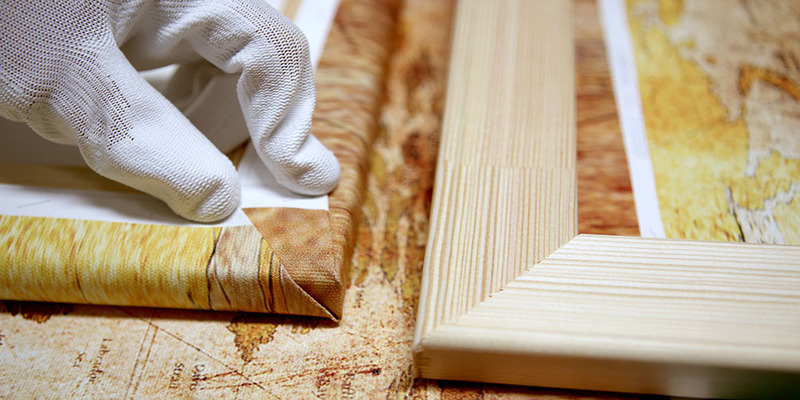 Several pine slats will decide how your canvas would be presented on the wall. 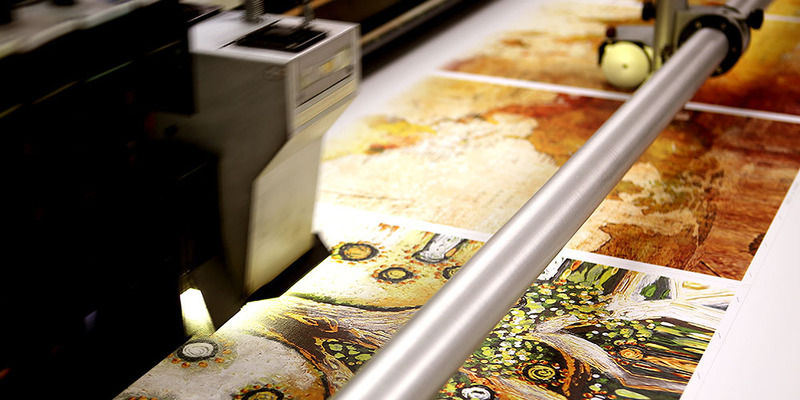 Therefore, we are preparing looms with perfect accuracy so it is ideally suited for the canvas print. The pattern is printed from a special source file with very high resolution taking into account a wide edges that will aesthetically cover the loom. 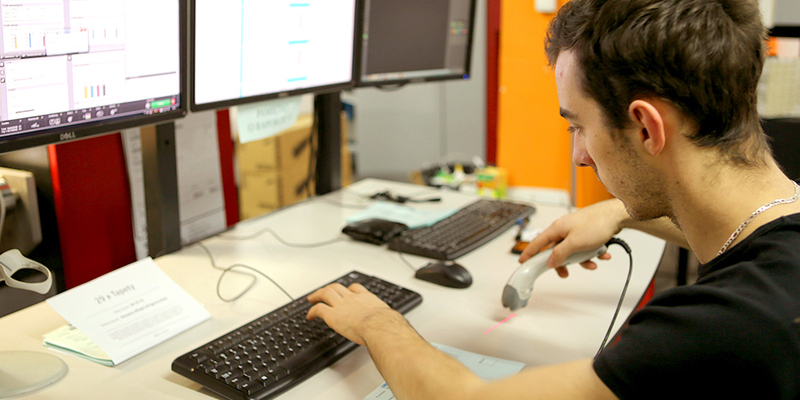 To make sure that each pixel is in the right place we use the printer with a resolution up to 360dpi! 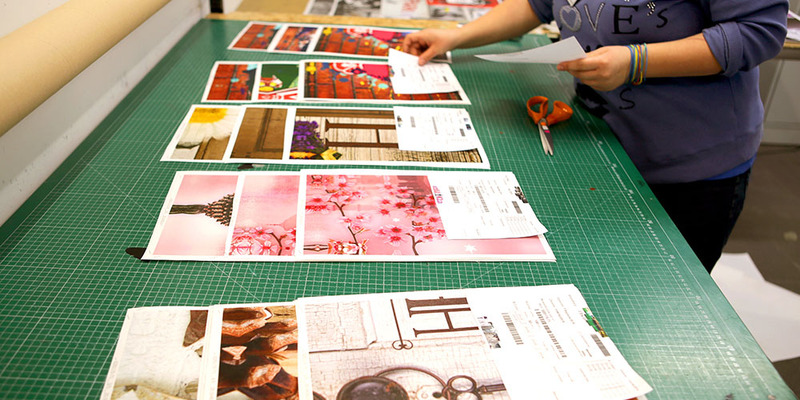 Large format printers used in Bimago allows us to print multiple pieces of patterns on a single canvas stripe - simultaneously. Then we are ready for the careful excision and segregation into individual parts of a canvas print. 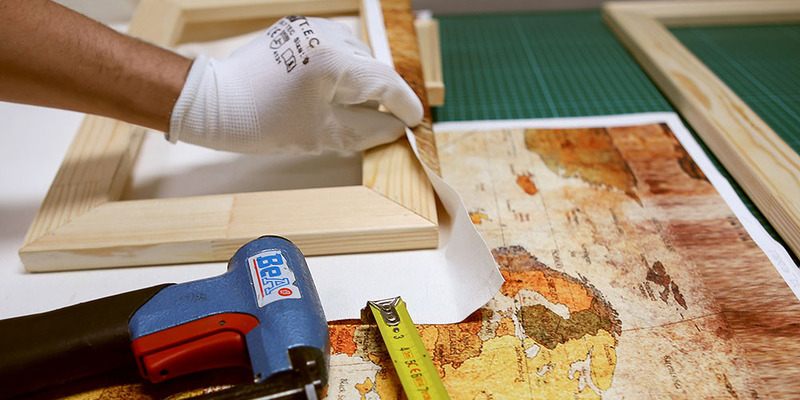 As soon the canvas print is ready we carefully cut it out and prepare the canvas for the assembly on wooden frameworks – the coloured canvas also covers the edges of the stretcher bars. As a consequence, the digital print can be hanged even without adding an external frame. Keep in mind that after each production step we perform a specialized quality control. 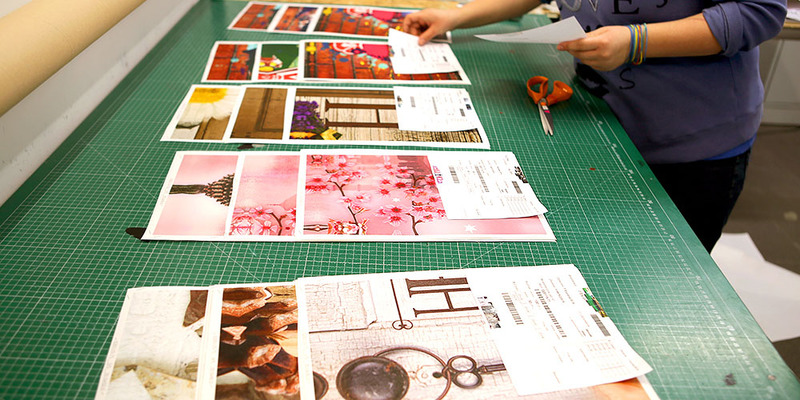 Before we start packing we have to make sure that canvas print is perfect in every detail! Stretcher bars used in Bimago are nailed from a solid pine, but still remain quite delicate. 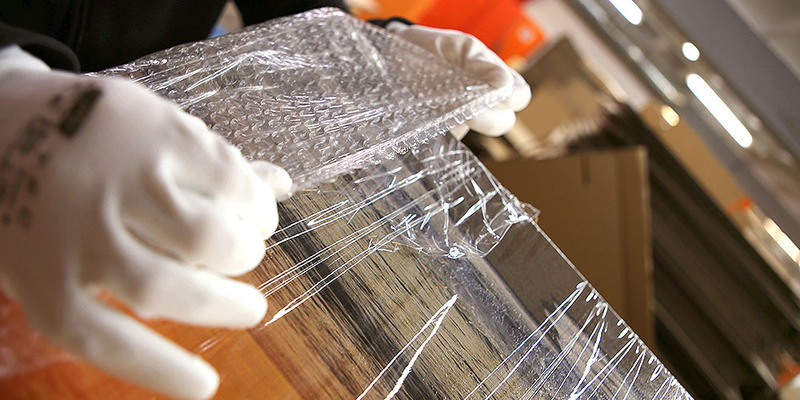 We secure the canvas with a bubble wrap and a layer of stretch in order to make sure that nothing could be damaged during transport. 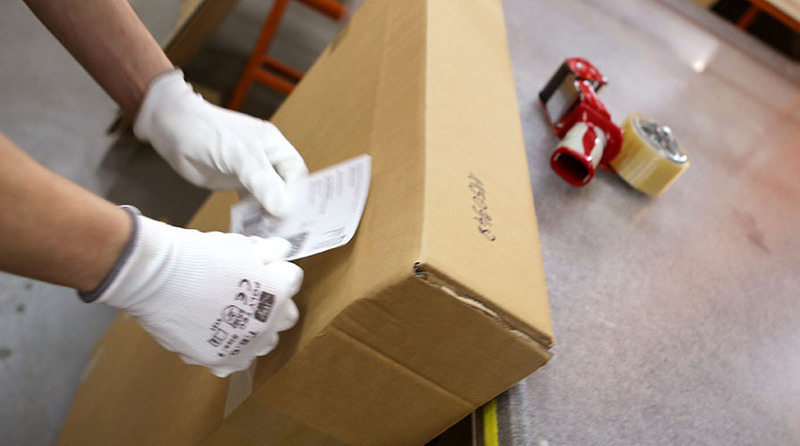 The size of a carton box which will contain your order during the transportation is always carefully calculated and adjusted to the size of the loom. In addition to canvas print we will add all ordered accessories. 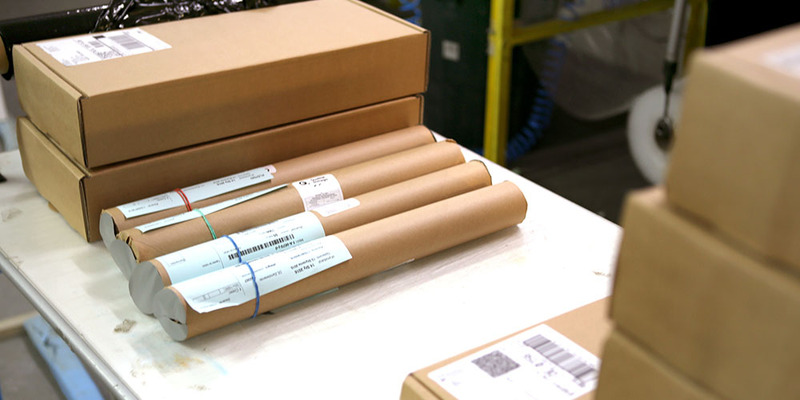 When the package is ready it goes to the logistic department in order to receive a waybill with your address. 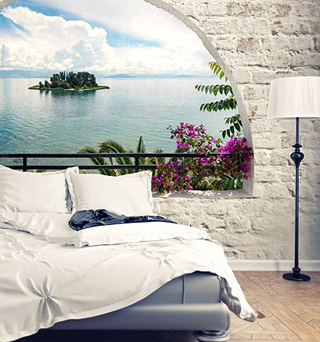 Soon a courier will knock on your door and you will be able to decorate the wall as you dreamed of! What is the uniqueness of the Premium Print service? Available only on Bimago technique it allows you to combine the advantages of a modern print and classical handmade painting. 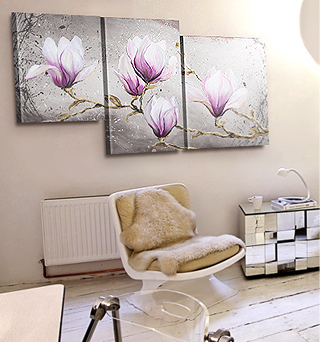 Ideally accurate canvas print becomes three-dimensional with texture and deep color as worthy as the best oil paintings. These are not just empty words. Find out for yourself as the effect is visible to the naked eye! The secret of this service is a special gel. It is levied on manually by a particularly experienced artist-painter, responsive to the original composition of lines and colors that would be emphasized by a structure gel. 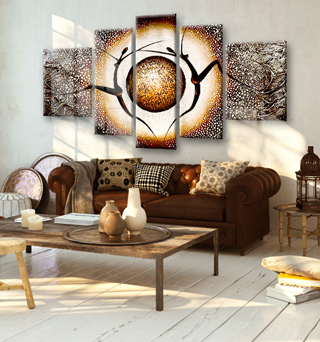 Do you want to see how it differs from a traditional canvas print? 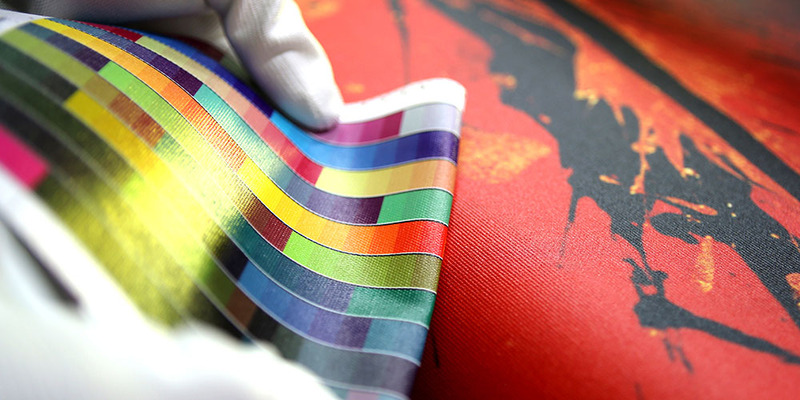 Check out gel application process and see how it affects the structure of a canvas print. Premium Print service is available for all motifs in the Bimago collection. You can choose when placing an order, just mark the box ("Technology" overlap) before adding the product to the cart. Your future wall decoration will be accompanied by the order request through entire production process. This document will contain a full specification about your painting. Once we process the payment, the order request goes to the production department - and the work starts! Firstly: the canvas print. 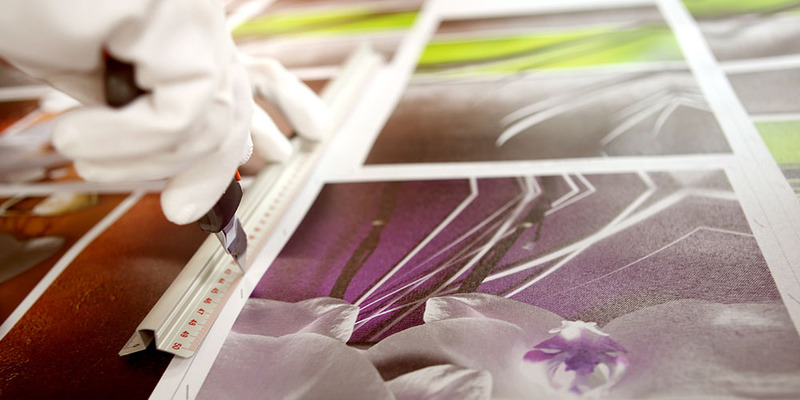 Using the finest Swiss printers on 100% Italian cotton canvas. Then: excision. Fragments of the pattern are cut into individual parts which can be stretched on a loom. 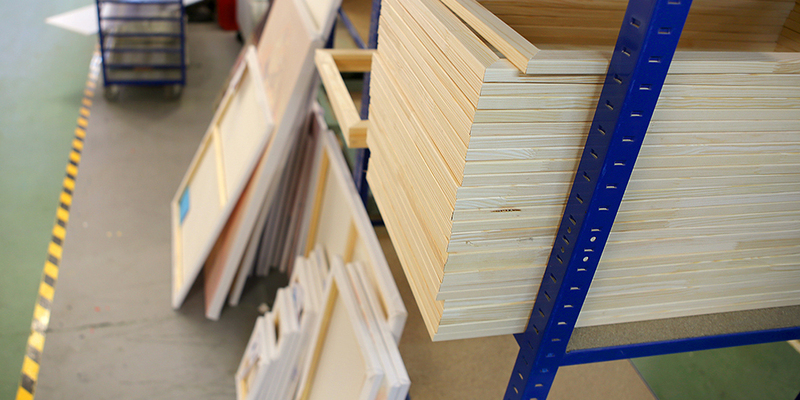 For each part of the canvas print we prepare a pine loom in appropriate numbers. Using special tools we stretch the canvas on the loom. Now the canvas print is ready for a Premium Print service specialist. 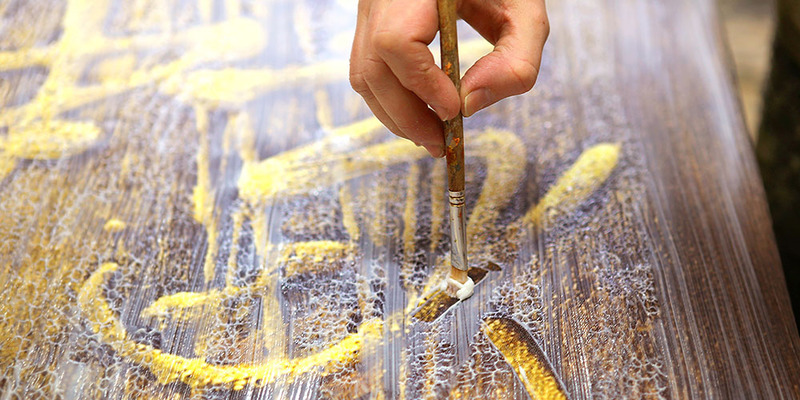 A qualified painter, responsible only for Premium Print service, using a special brush applies the acrylic gel on the canvas. 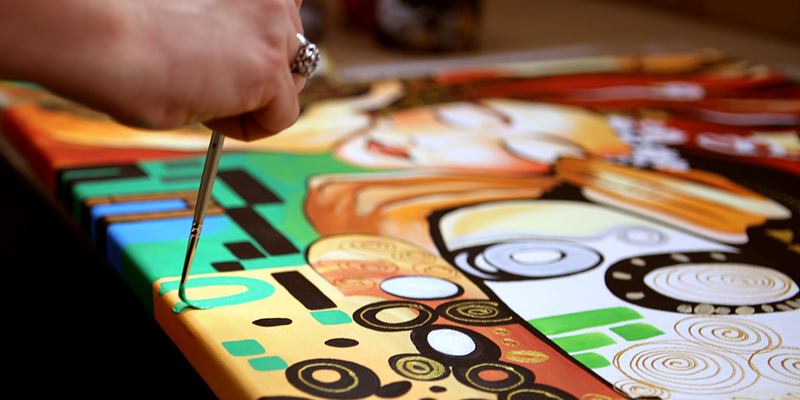 The gel is maintained according to the lines of a color on canvas print in order to emphasize the pattern. 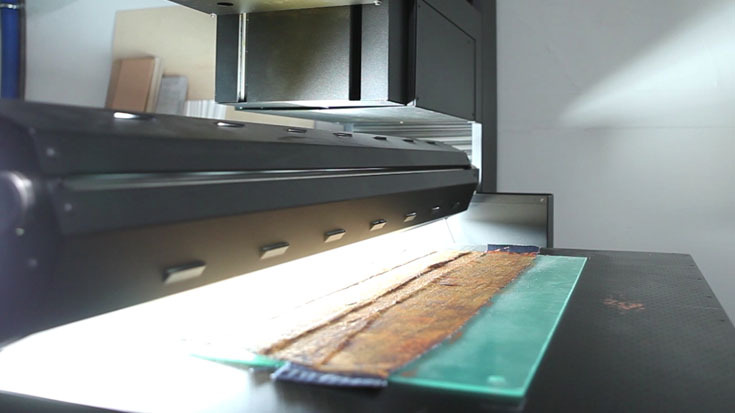 Print covered with the gel needs to be dried - varnish will safely dry out and gain transparency. 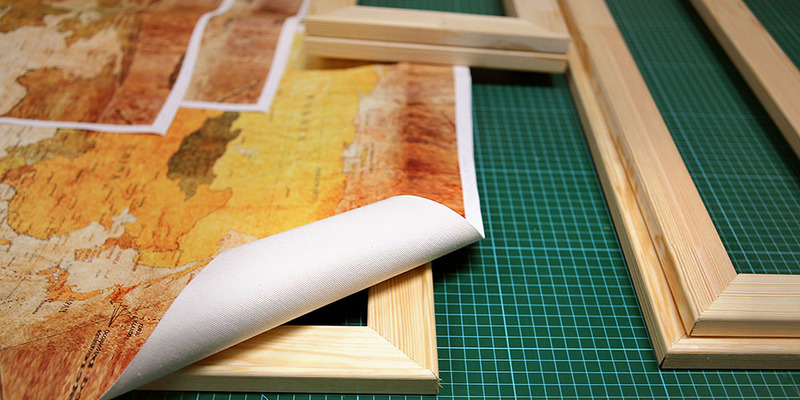 The canvas print is accurately controlled after drying just like on each of the preceding steps. 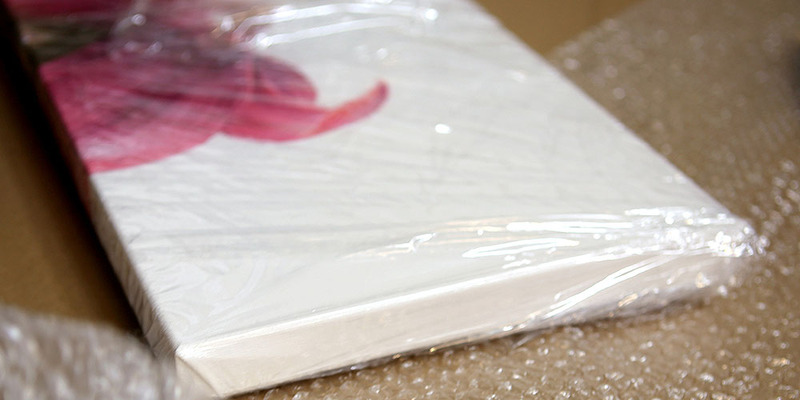 We use stretch and a large amount of a bubble wrap to make sure that canvas print can be delivered securly. 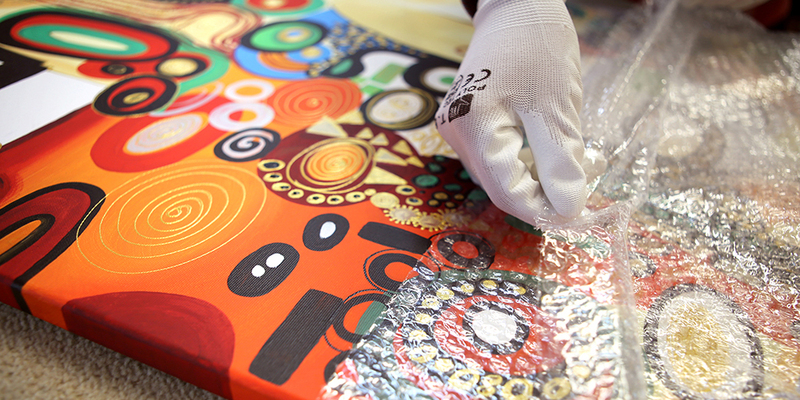 Each part of the print is wrapped separately and then all again wrapped in a thick layer of foil. The canvas print is, once again, checked by the quality control department and properly secured to finally be handed over to the packaging department who prepares a carton box perfectly matched to the dimensions of the painting (including the ordered accessories). The package is almost ready! Last step is to glue a waybill. Now your canvas print is going to be handed to the courier. 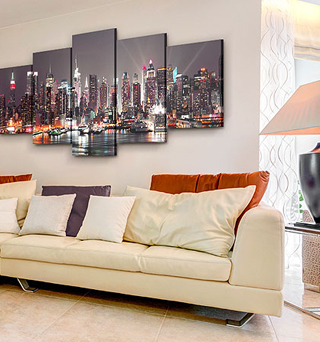 Within a few days the canvas print will decorate your wall. Who would have thought that such a simple and quick to install decoration requires so much attention during production? Before a sheet of colored foil transforms into a tasteful sticker on your wall it has to go through many steps. Cutting, trimming and securing a special protective foil are just a few of them. Do you want to know them all? 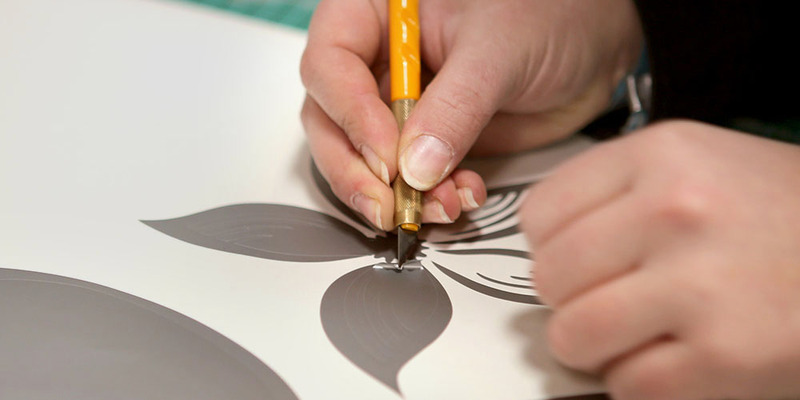 Keep reading to find out how Bimago wall stickers are made! 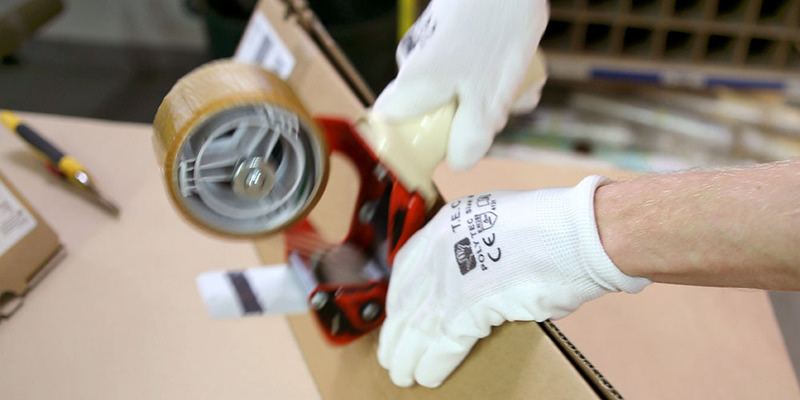 Find out which of the production steps are hand-made and how we pack them to make sure that they will be delivered to your home unharmed. 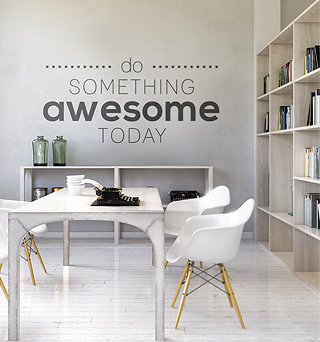 The last step is always yours – assemble the ordered sticker and see how beautifully and finesse it looks on your wall! Favorite quotations, subtly curved twig showered with flowers, pop art explosion - all this can become an inspiration for the project of a sticker, which will be displayed in the Bimago collection. All the details have to be confirmed before we proceed to print your wall sticker. All important data such as color, luster, size and a structure will be placed in an order request which guides the production department during whole manufacturing process. 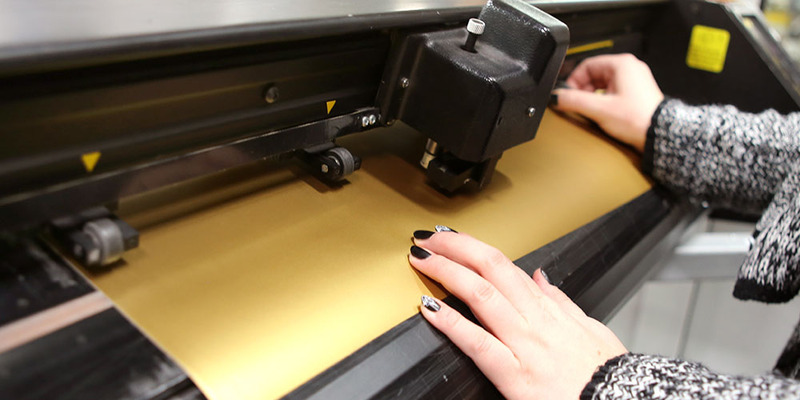 Trimmed sheet of adhesive foil goes into a special plotter, the cutting process starts and a final result is ... a sheet with the same shape. Cut lines, which are arranged in a really incredibly, subtle patterns - can be watched only up close. Using a special knife, we proceed to the precise process of excess foil removal in order to reveal the correct sticker. This step requires not only skill and intuition, but also precision.Any, even the smallest feature, must not be destroyed. It is very important for us that each element of the sticker remaines in its place during transportation. That's why we put it on a strong film that protects the sticker against mechanical damage. 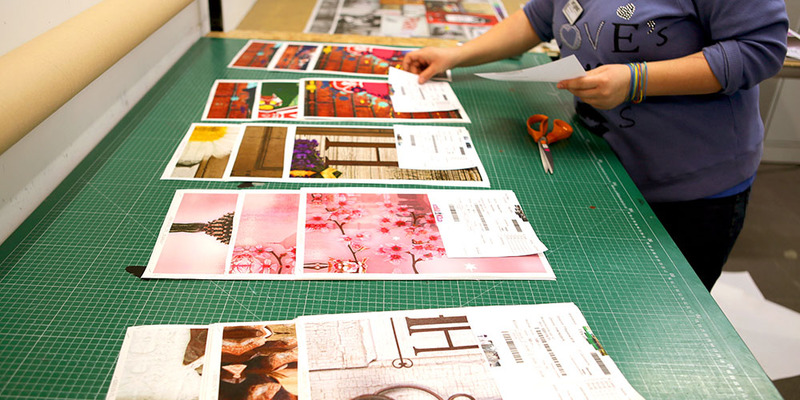 After each step in our production process, the wall sticker is checked by a skilled employee from our quality control department. Before we proceed to the packaging we have to be sure that we send you a decoration worthy of your walls! In addition, to the protective foil applied to the sticker, we also secure it with more conventional methods. It is curled up in a tight roll, then the entire roll is wrapped in a bubble foil. 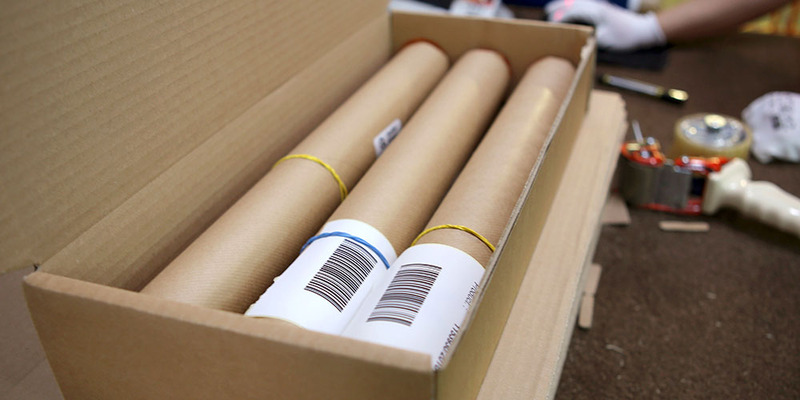 Sticker transport boxes are specially designed to be as comfortable as possible in carrying a round roll. 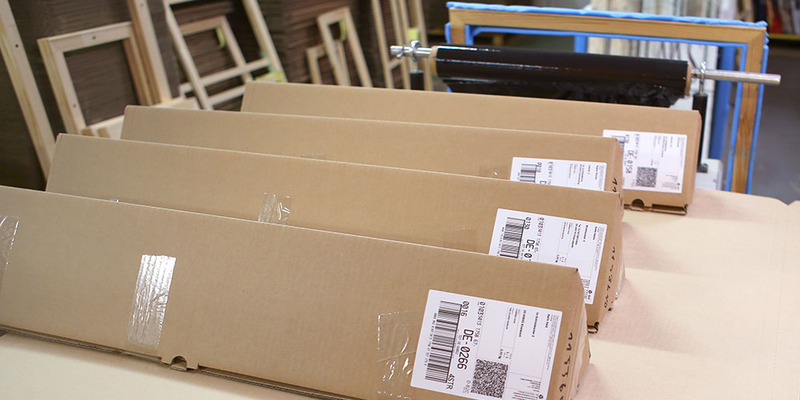 Wall stickers, packaged in three-sided parcels, are now almost ready for a courier pick-up. The execution responsibility is the last step and lies at the logistics department. 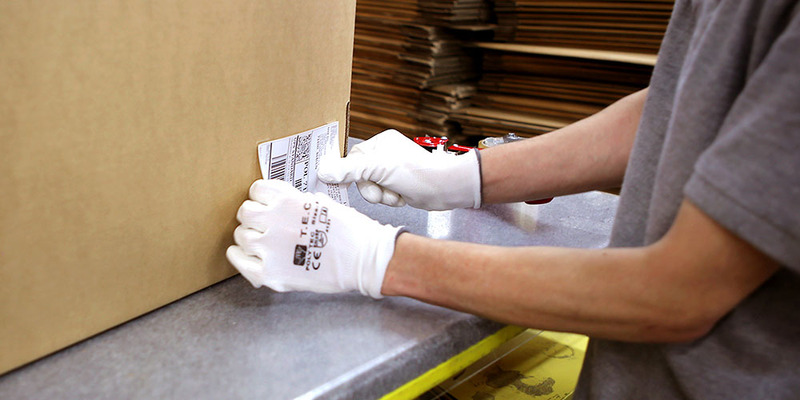 Here, every parcel receives a waybill and a shipping number with your address. Soon the parcel will reach you and your wall will gain a new unique decoration. Bimago non woven wallpapers - a unique product. 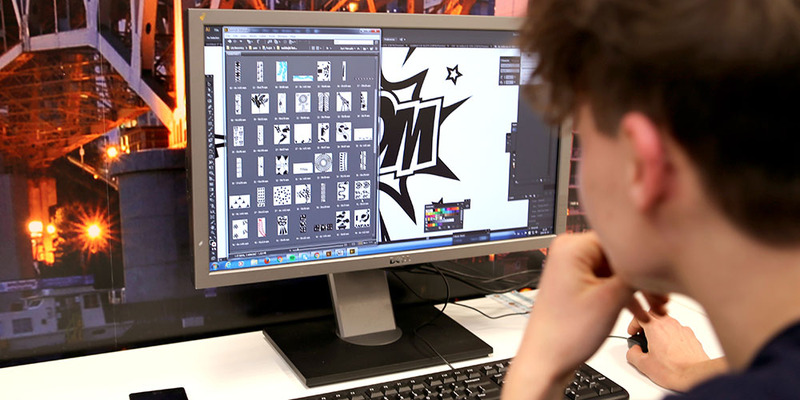 They are born in the creative graphic studio. Designers are looking for a special effect among the paints, scraps or especially interesting textures which often catch their attention. Hence soon - a new pattern, which your apartment is waiting for, will be ready! And when you order it the new pattern is sent to the most modern, almost cosmic printing machine. We create decorations that are not among the usual size - the most important is the quality and accuracy of the pattern. Each wave on a paradise beach must be explicit, a printed rose in the vase must have a color as fresh as in reality. 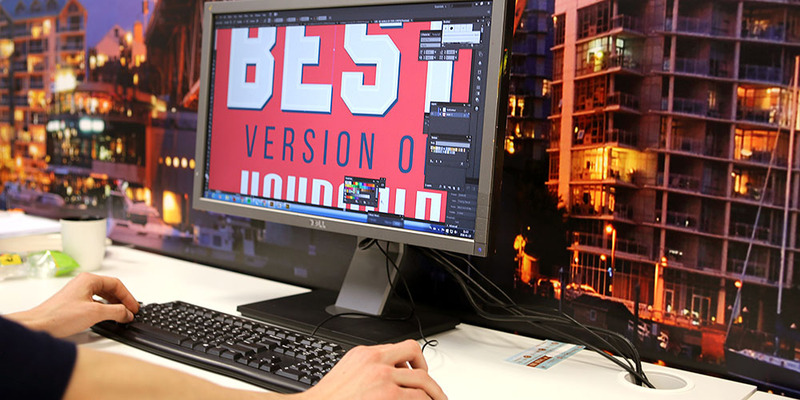 All of this is to create a product that’s not only perfect in every pixel, but also delightfully original! We look forward to receive your order and starting the production. The first step is to print an order request - document specifying exactly the ordered wallpaper. 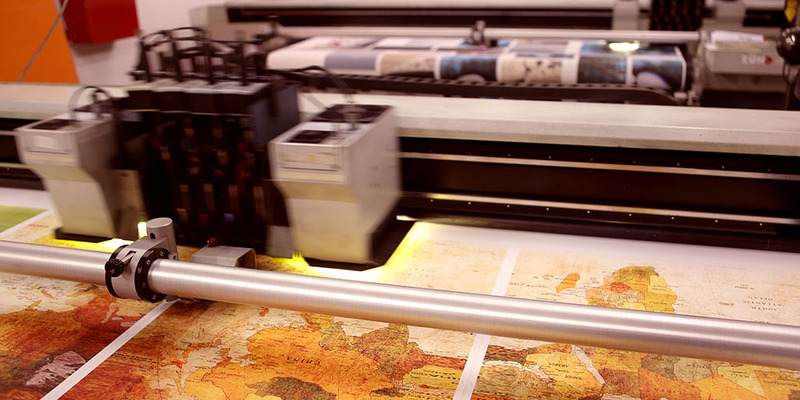 Printing a wallpaper is always a challenge! 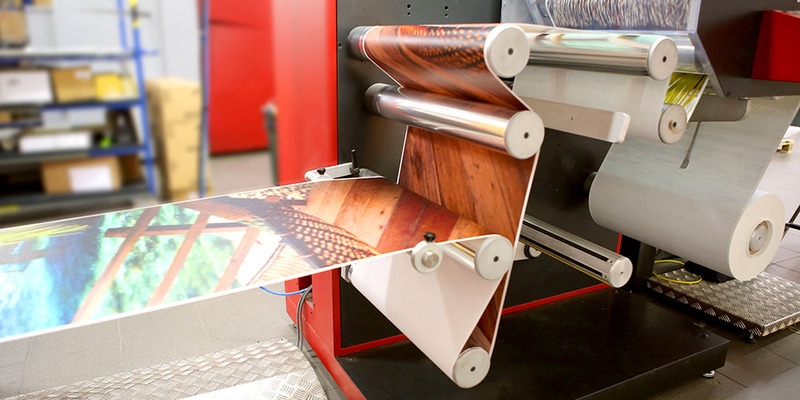 It requires using special printers designed especially for long rolls and high print resolution (up to 600 dpi). 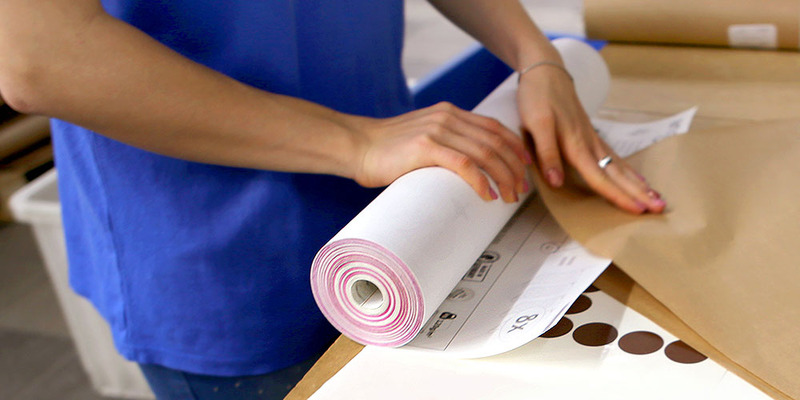 Roll of non woven wallpaper coming from the printer requires to be cut into individual wallpaper parts. In regards to the next parts, the finished wallpaper rolls also contains an installation instruction that is printed on the first part. Wallpapers are not an exception and like any other product in Bimago they are subjected to our quality control. We always check for any manufacturing defects on the wallpaper material and make sure that it’s sharp and crisp. Only wallpapers fulfilling all the conditions deserves a Bimago quality mark. Did the wallpaper pass quality inspection? This means that it's time to start packing. Firstly: transport protection. 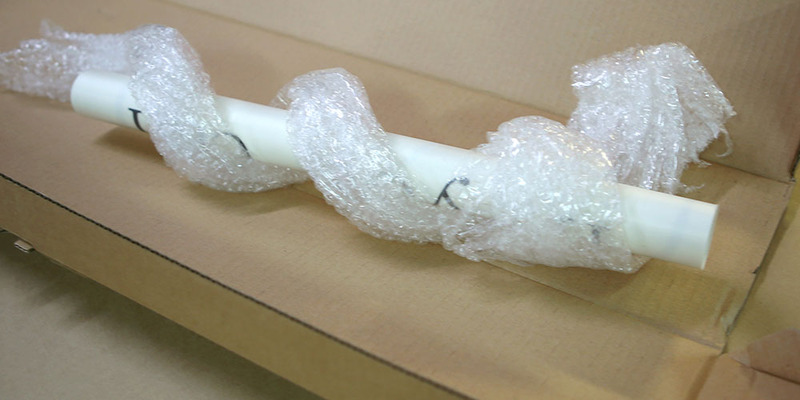 Carefully wrapped, the roll is neatly packed in a thick layer of protecting paper. Obviously you won't receive your wallpaper just as a plain roll. 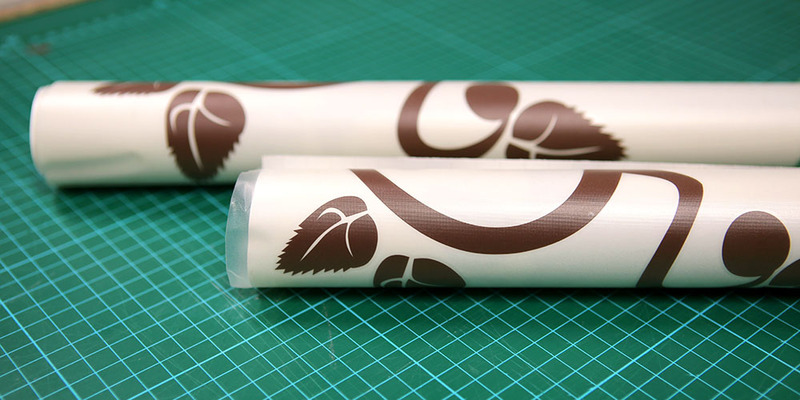 Therefore, we have designed a special package, in which the wallpaper rolls could be conveniently arranged. Safety during transport, above all! 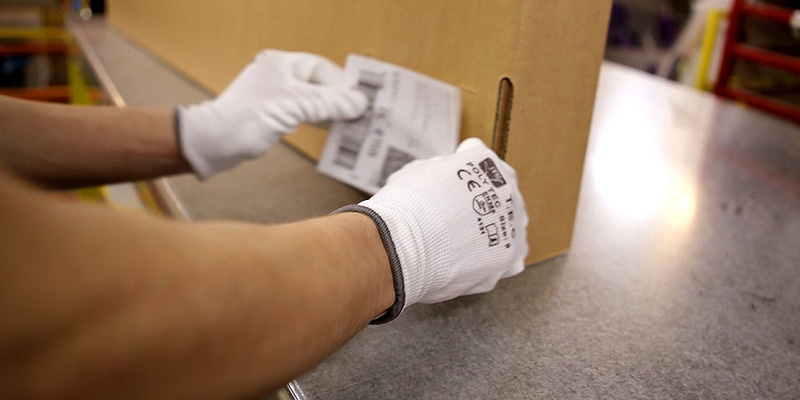 The tightly sealed parcel is sent to the logistics department. 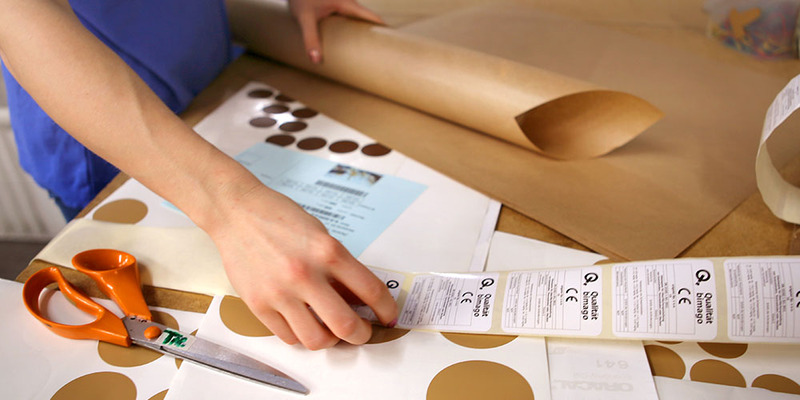 Here we will prepare a waybill to make sure that ordered wallpaper will be delivered directly to chosen address. In a few days you will be able to stick it on your wall!